I would like to share here my opinion on five more top rifle calibers for the international hunter. How can a hunter not include the .22 rimfire in his list of popular calibers. This cartridge was developed by the J Stevens Arms and Tool Company way back in 1887. Since then, every arms manufacturer has produced rifles in this caliber. The cartridge is popular in all areas of the world. There are many competitions with this caliber and many young hunters are introduced to firearms with this cartridge. The cartridge is low on recoil, cost, and noise. When I was in high school in Kenosha, Wisconsin, USA, I was given an Ithaca Model 39 single shot lever action saddle gun in .22 rimfire. My brother and I would walk to the woods near our house and hunt squirrels and cotton tailed rabbits. If I walked with a gun in this area at the present time I would no doubt be arrested. When I was in College I bought a new .22 rifle. I own a Marlin Golden 39-A Lever Action Rifle with a Simmons 3-9 X 42 scope. I spent many of the halcyon days of my youth hunting Grey and Fox Squirrels, Cotton-tailed Rabbits, and Snowshoe Hares in the mixed forests of Central Wisconsin with this rifle. This was in 1976. I used CCI Stinger ammunition which had just been introduced. I liked the crack!! sound of the Stinger. With it's hollow pentagon head, the Stinger was a devastating cartridge on squirrels and rabbits. Still is. I think that most hunters have started out with a .22 rimfire. In 2004, the dynamic duo consisting of the firearm manufacturer and ammunition manufacturing company of Ruger and Hornady, respectively, introduced the .204 Ruger. The .204 Ruger is a super hot centerfire cartridge intended mostly for Varmint shooting. Hornady offers cartridges loaded with 32, 40, and 45 g bullets. The snappy 40 g bullet travels 3900 fps at the muzzle. Sighted in at 200 yards the bullet drops a mere 4.3 inches at 300 yards and 13 inches at 400 yards; plenty of distance for even the most spooky Prairie Dogs. One very pleasing aspect of this cartridge is it's almost total lack of recoil. This makes for a continued sight picture upon firing and a very delightful day in the field. I own a Ruger Target Grey .204 Ruger with a 4-16 X 50 Mueller scope. The rifle and scope combination weighs more than 10 pounds and absorbs the recoil from the .204 cartridge like a sponge. It is a very pleasant rifle to shoot all day long. I have shot a lot of Prairie Dogs in South Dakota with the .204 Ruger rifle and Mueller scope combination. One time, on the Rosebud Reservation in South Dakota, USA, my Indian guide and I were zeroing in on the Prairie Dogs from 150 to 450 yards. Steve, the Brule Indian guide, would spot the dogs with binoculars; then tell me how far the dogs were. We made an excellent team with the highly accurate .204 Ruger rifle. The cartridge and rifle accounted for many dusted dogs. A brisk wind started to blow. Gusty winds are common on the prairies out West. It became necessary to aim about a yard to the side of the dogs to account for the wind. We still hit them. This is the only negative aspect of shooting the .204 Ruger. Windy conditions can affect the accuracy of the bullet, sometimes to a great extent. Other than that it is a magnificent cartridge capable of taking Coyotes, Prairie Dogs, Bobcats, Fox, and other Varmints in North America. The .204 Ruger would be excellent for Black-backed jackals and other Varmints in Africa. In 1955 Winchester introduced the .243 Win cartridge for their Model 70 bolt action rifle. It gained wide popularity. Remington quickly followed with their own rifles chambered for the cartridge. The .243 Win remains one of the most popular cartridges in the world. The .243 Win was voted the most popular cartridge in South Africa, Namibia, and SW Botswana due to the fact that it can take Springbok and Blesbok at long distances up to 300 meters. My friend in South Africa, a Professional Hunter, told me he once guided a young lady who had taken all the plains game in South Africa, even a Giraffe, with a .243 Win. It goes to show what a well placed bullet can do. at 400 yards; good enough for Pronghorn, Springbok, and Blesbok. I own a Ruger .243 Win with a Nikon 4.5-14 X 42 Buckmaster scope. I shot my first two Pronghorn Antelope in Wyoming with this rifle. I have harvested a coyote in Wyoming with the rifle. I have shot Prairie Dogs and Rabbits in South Dakota with this rifle. My .243 Rifle is now fitted with an ATN Pallidan first generation night vision scope. The next cartridge for the International Hunter is the popular .30-06 Springfield. The .30-06 Springfield was introduced to the US Army in 1906. It replaced the .30-40 Krag. The .30-06 remained the main battle cartridge of the US Army for 50 years before it was replaced by the .308 Win and the .223 Rem. The .30-06 is the most popular hunting cartridge in North America after 100 years and is also very popular in Africa. Every species of North American Big Game has been harvested by the .30-06 and probably every species of African game also. I own a Remington Model BDL .30-06 Springfield with a Leupold 3-9 X 42 scope. The .30-06 Springfield can be loaded with a myriad of Accellerator and 30 calibre bullets. The ammunition is widely available in most parts of the world. The cartridge is capable of long distance shots. A rifle firing 180 g bullets sighted in at 200 yards drops about 8 inches at 300 yards; plenty of distance for most Big Game. I am a gun fancier and like to utilize a wide variety of cartridges when I hunt. Therefore, I have harvested most of my big game with cartridges other than the .30-06 even though the 06 could have done the job quite nicely. I have shot two American Bison Bulls in South Dakota with the .30-06. The 220 g bullets performed quite well on the Bison. I have also harvested a Rocky Mountain Elk in Wisconsin. The Elk was hit in the lungs with a 180 g bullet and dropped immediately. The Elk required a followup shot to dispatch it. I think the .30-06 Springfield may be my favorite caliber if it were not for the .300 Win Mag. The .30-06 is versatile, powerful enough for most species, made by every rifle manufacturer, and reloading components and hunting cartridges are readily available throughout the world. In 2007 Hornady and Ruger teamed up to produce the powerful .375 Ruger. The .375 Ruger was developed to compete with the .375 H&H Magnum, which has been the most popular Big Game cartridge since the British armsmaker Holland and Holland introduced it in 1912. The .375 Ruger, with a 270 g bullet, has a muzzle velocity of 2740 fps as compared to 2690 fps at the muzzle for the .375 H&H. The energy produced by the .375 Ruger at the muzzle is 4835 foot pounds as compared to 4337 foot pounds at the muzzle for the .375 H&H. It appears that in both velocity and energy that the .375 Ruger has the edge over the .375. The .375 Ruger cartridge is shorter than the .375 H&H and can fit in a bolt action rifle with a standard .30-06 length action. The .375 Ruger brass is shorter but has less taper than the .375 H&H. The .375 Ruger cartridge can actually hold more powder than the .375 H&H. This added powder is what gives the .375 Ruger it's advantage. This added powder also generates more recoil. I have shot both the .375 Ruger and the .375 H&H. The .375 H&H is a lamb compared to the shoulder bruising lion-like recoil of the .375 Ruger. All other aspects considered; excess recoil is the only negative consideration that I can name for the .375 Ruger other than the fact that it is a new cartridge and not readily available throughout the world. In 2006 and 2007 Steve Hornady and Col Craig Boddington used prototypes of the new .375 Ruger to harvest a number of African Big Game animals including the extremely tough Cape Buffalo. The cartridge performed extremely well and the Cape Buffalo targeted were dispatched cleanly. Production of the .375 Ruger rifle began in 2007 with the introduction of the Ruger Hawkeye 'African' and 'Alaskan'. Both rifles were meant for serious Big Game hunting. I own a Ruger Hawkeye 'African' .375 Ruger with a Leupold 3-9 X 50 VX-1 riflescope. I believe that I am one of the first to own and use this powerful rifle. 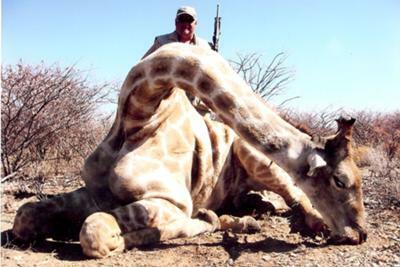 In August, 2007, I took my .375 Ruger to Namibia, Africa, and had the opportunity to shoot an Angolan Giraffe. Giraffes are tough. The rifle performed splendidly and the Giraffe was harvested cleanly. The .375 Ruger is a fine cartridge for large and dangerous game if one can get accustomed to the recoil and not flinch upon firing. Considering the recoil of a .458 Lott or a .505 Gibbs; an African hunter worth his salt should be able to handle a .375 Ruger. You guys are wrong about the 243. I am a south african hunter. The firearms I hunt with are 243 win 303 brit 300 win mag and a 375 ruger. The most popular caliber in SA by far is the 30-06 folowed by the 308win,303 brit and the 243 win. 243 is our most popular springbuck caliber by far and also a firm favorite amoung jackel hunters. The 375 h&h is our most popular big bore folowed by the 9,3by62 but the 375 ruger is catching on fast over here thanks to the well priced howa rifels it is chanberd in. I just got me a 375 Ruger Alaskan. I was a little scared to shoot it - seens how its a cannon of a gun. My first shot I thought its gunna hurt. But I was just being a pansi. It kicks like a 30.06. The huge stock is a life saver as for the other .375 modules probably kick like a mule. Don't agree on the .243 statement. Don't know where the stats come from that says the .243Win is THE most popular caliber in SA. Maybe in spesific areas of SA yes, but not all of SA. Last time I checked it was 30-06SP tops with .270Win second, .308Win third and .243Win at fourth for SA hunting overall. Still a very popular caliber though ! I learned alot about the different rifle calibers. As a prospective huntress, I would choose the .243 Win, because of the low recoil. The information on the calibers was very informative. Great info on hunting Calibers! Great information on calibers. Just the information I needed for my first hunting rifle purchase. Thanks for the insights! Just don't shoot a mighty giraffe with a .22LR! A very good selection of calibres. There are so many legitimate calibers and so many wild cat calibers that it was probably a tough job to name a few favorites. I am intrigued by the .204 Ruger. Sounds like a winner and one suitable to a young hunter due to its absence of recoil.